Read how our beloved previous associate editor creatively parallels sermonic appeals with the experience of flying. The author writes about worship within the context of gathering around a table for a meal. We must always remember that worship is not about the preacher, musicians, or children’s storyteller. God has created us as wholistic beings--a wonderful blend of spiritual, mental, social, emotional, and physical. Our journey through their story can be found in Luke 24. When the leaders whom God calls allow Him to have complete control of their lives, the spirit of self-sacrifice, servanthood, and humility will exert a power for good over those they influence. 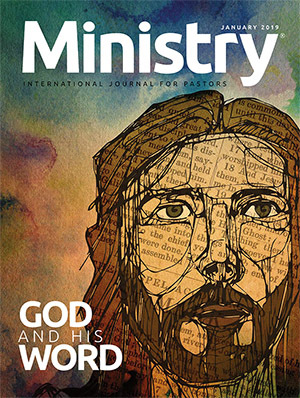 In this double issue, we focus on the important themes of the second coming of Jesus and mission. Those who attend our churches need to be reminded that Jesus is coming again and that His coming is both sure and imminent. The Sabbath is not about me. It’s about God. As you reflect on ministers who have impacted you, whether in the past or present, take the time to let them know how much you appreciate what they’ve done for you. Had she punched me in the stomach, her exclamation could not have hurt me more. How do you handle being treated unjustly and taken advantage of? As a result of this interview, you will gain a deeper understanding of the work and involvement of these leaders in the religious liberty and public affairs in our world. 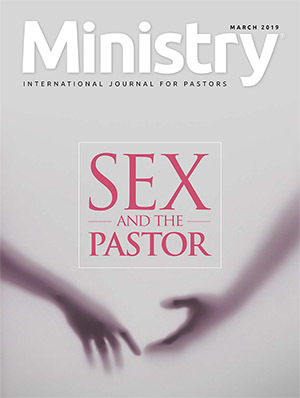 The editors of Ministry interview the theologians of the Biblical Research Institute. How is your life journey? Are you so consumed with sermon preparation, church administration, and a myriad of other responsibilities that you’ve lost touch with those who see life through different philosophical lenses? The example that we establish goes a long way in setting the tone for gender relations in our churches. My overarching aim for 2012 is to model my life according to the will of Christ as revealed through His life and teachings. Read why two pastors’ wives became involved in Women’s Ministry. Thoughts on performing the theological task well. 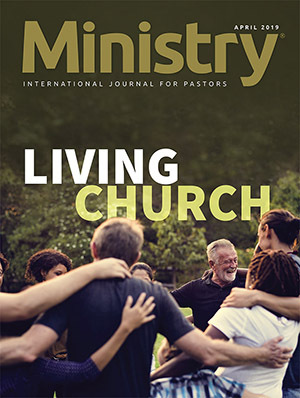 Read about a program that provides counseling and support services for Christian leaders—The Ministry Care Line. Becoming responsible for the faith we proclaim. Our special issue looks at North America. A look at four consequences of true biblical spirituality. David Trim, Rowena Moore, and Benjamin Baker answer questions about what they call “a three-legged stool—archives, statistics, and research” that represents a department at the General Conference headquarters. How do you develop and maintain a healthy family life? Get tips about one of the toughest jobs anyone can tackle. Ministry’s editors dialogue with the president of the North American Division. A successful marriage is not composed of just two individuals (certainly not male and male or female and female); rather marriage includes three individuals: the man, the woman, and God. Dr. Donkor shares the pervasiveness of spiritualistic manifestations in the end-time church. Only as I grew older could I value both the importance and equality of the Holy Spirit. Unity composes a prominent element of this month’s articles. European people live in a society that has left Christianity behind—how do Christians witness in this atmosphere? This month’s lead article features an interview with Hyveth Williams, a professor of preaching at Andrews University. She calls for preachers to exercise the authority that God invests in them both locally and nationally. And no doubt exists in my mind that there are many such pastors who lovingly proclaim the high expectations of God. God, however, in these last days, seeks yet more men and women who will exclaim His Word—regardless of the possible ramifications of doing so. . .
No time clock can measure what ministers invest throughout their lives. I hope that in five years we are in heaven. I really hope that will be a reality. I certainly believe that the world is fast coming to that climactic event of Jesus’ imminent return. 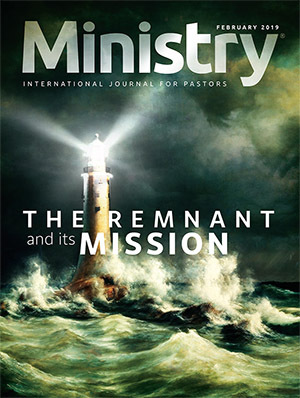 Until that time, we are to work in a dynamic way, through the power of the Holy Spirit, so that the Lord will use the church—and I believe this is God’s remnant church with a unique message and a unique opportunity— to share the three angels’ messages of Revelation 14. That is our mandate. A discussion with those who ensure the financial integrity of the church and its entities. Ten ways pastors can express appreciation to the church members who lighten their load. Discussing what happens to family and assets after a person dies is not a favorite topic. But that discussion must take place. Developing a sense of family in the body of Christ. The worldwide Seventh-day Adventist Church pays tribute to a fallen leader. This month marks the third October in a row that Ministry has featured a particular geographic region of the world field. As a car can still look good, although the fuel tank is empty, so also can we as ministers still look good to others when our souls are empty. But we are spiritually ineffective. The focus of Hope Channel involves spreading the message of Jesus Christ, but it's not the technology that's important-it's the message. If you are reading this issue and are going through your own personal "storm," I pray that you will experience the full strength and support that the Comforter, the Holy Spirit, stands ready to give to you. This ministry does more than just respond to disasters. ADRA is the Adventist Church's clearest expression of its commitment to acts of justice, poverty reduction, and responding to human needs and human rights. The Seventh-day Adventist Church, in order to care for its worldwide mission, has 13 world administrative regions. Three of these regions-the Northern Asia-Pacific Division, the Southern Asia-Pacific Division, and the South Pacific Division-encompass the territories of the Pacific Rim. 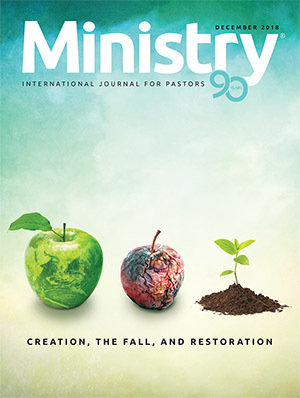 The editors of Ministry interviewed the leaders of these three regions-Jairyong Lee, Alberto Gulfan, and Barry Oliver, respectively-who addressed a wide range of issues. The Seventh-day Adventist Church for many decades has used technology as one way of carrying out its mission. Hope Channel is an important tool for pastors and congregations. During a recent interview with the editors, Hope Channel president Brad Thorp and vice president Gary Gibbs shared some of the latest developments of this television ministry. Pastoring of multichurch districts poses many challenges-not just territorial and logistical. How do pastors do it? Where do they turn for counsel and encouragement? Theology can be dry and boring, or maybe you'll smile. Which would you prefer? Two pastors share their hopes for this evangelistic initiative. Multichurch district pastors in Jamaica explain how they handle different ministry challenges. One of our hopes that we wanted to see fulfilled was conducting a contest for student writers-men and women who attend colleges, seminaries, and universities, who are studying for the ministry or in some other area of religious studies. When Kathy and I married, I had already been pastoring my first multichurch district for two years. Marriage brings with it many adjustments-indeed, those of you who are married understand what I am saying. But for my wife, it was particularly challenging: a young bride living apart from her family for the first time, not having any pastoral spouses in her immediate family to serve as role models, becoming a part of church families that knew me but didn't know her. "Preaching each evening in an evangelistic meeting is spiritually exhilarating," states the speaker for the upcoming Discoveries '08 series. Such passion all preachers should possess. Remember how you felt before you preached your first sermon? All kinds of thoughts raced through your mind-Did I study enough? Is the sermon properly organized? Will I have good eye contact with the congregation? Or will my eyes be glued to the notes? That's how our team felt on March 31, 1998. You might not think that an agency associated with insuring church properties is involved in sharing the gospel. But it is. In countless numbers of churches, wives attend without their husbands and children attend without their fathers. In a world in which millions do not have televisions, radio continues to be an indispensable method of sharing the love of God with others. How many people in your congregation read the Bible regularly? What about your denomination? You might be surprised at the low ratio. "Follow the Bible" is an initiative launched by the Seventh-day Adventist Church, but we believe that all denominations would benefit by designing their own programs to encourage greater reading of the Word of God. There always will be the solo pastor to conduct the bulk of the church's business. Such pastors must be competent in several areas of church ministry. The ministry of the General Conference secretariat does far more than keep the official minutes of various committees. Their work changes lives. "When you think about the word judgment, what thoughts come to mind?" I asked my Christian Beliefs class. As a rule, the answer would be negative. Occasionally, however, a brave voice would state the opposite. My goal in broaching the subject was to emphasize the truth that judgment, whether divine or human, when correctly conducted, is the best thing that could happen. Then Jesus went with his disciples to a place called Gethsemane, and he said to them, â€˜Sit here while I go over there and pray.' . . . Then he said to them, â€˜My soul is overwhelmed with sorrow to the point of death. Stay here and keep watch with me' " (Matt. 26:36, 38, NIV). To celebrate one hundred years of ministry to youth, the youth leadership of the General Conference refl ects upon what has been done and what remains to be accomplished. Ministry interviews a physician who, along with his wife, has been on the front line in the battle against the AIDS epidemic. Church leaders and academicians from Africa ponder the present and future of ministry on their continent. It's not a matter whether disaster will strike, but when. What resources are at the pastor's disposal to assist in meeting such a crisis in the community? The Seventh-day Adventist Church, in order to care for its worldwide mission, has 13 world administrative regions. Two of these regions, known as the Inter-American Division and South American Division, are among the fastest growing areas in the world. The editors interviewed the leaders from these divisions, Israel Leito and Erton KÃ¶hler, respectively, and spoke about a wide range of issues. Three outstanding ministers in the Adventist Church share their thoughts on various ministry-related themes. The leaders of the Adventist Church in south Asia share their vision for the region and discuss the challenges and opportunities throughout the area.